For a fantastic day out! At World Museum you can enjoy a fantastic day out and enjoy five floors of historic treasures for free. From Japanese Samauri armour to bugs galore, from ancient Egyptian mummies and dinosaurs, to outer space, there’s something for everyone. There are baby changing facilities on levels 1, 3 and 4. Prams can be stored in the cloakroom near the main entrance. Please ask a member of staff for assistance. Visit our ‘Things to see’ page for our top ‘must-see’ list. Our quarterly Family Guide has details of our free family exhibitions, events and activities. It can be requested through our register with us page. A large print version is also available. If you would like to visit the museum and have specific access requirements for your group, please contact Gina Couch (gina.couch@liverpoolmuseums.org.uk), Steve Cross (steve.cross@liverpoolmuseums.org.uk) or Mike Graham (mike.graham@liverpoolmuseums.org.uk) to discuss these. Learning sessions are free of charge and usually link to the national curriculum through our collections and displays. Many sessions are led by a member of our team, while some are self-led. Booking well in advance is advised. 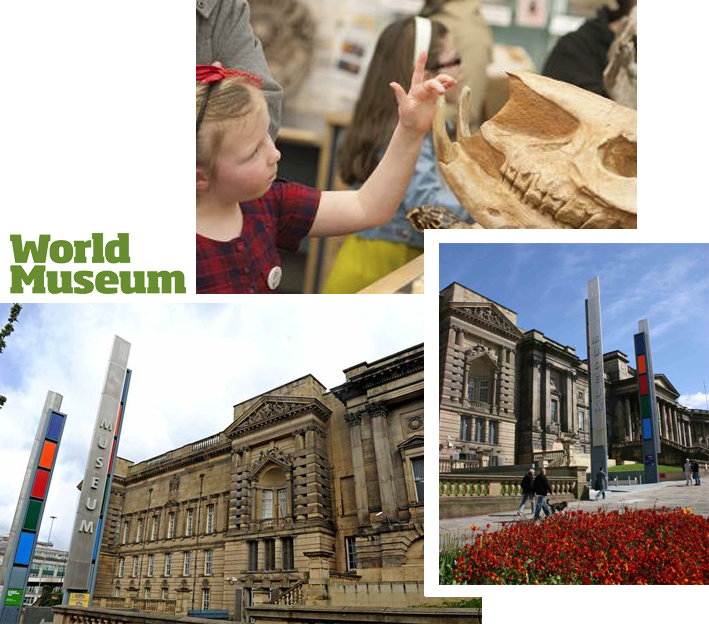 World Museum has a fantastic science offer taking in the Aquarium, Planetarium and Bug House, all of which run specially-devised sessions for schools. Top themes include Ancient Greece and Ancient Egypt, and there are also opportunities to study world cultures and natural history in our dedicated hands-on centres. Queen Square is located in the heart of Liverpool City Centre and is home to some of the best places to eat, drink and socialise. Queen Square is perfect for Parking and Dining when in Liverpool city centre as it is only minutes away from Liverpool One, the Met Quarter, Williamson Square St Johns Shopping centre and Church Street.